Brook trout are almost unheard of in greater Boston, which makes the Pine Tree Brook population a very rare and special population worth protecting and conserving. After years of planning, a team of volunteers led by NepRWA and the Department of Conservation and Recreation (DCR) began the first in a three phase dam removal and stream restoration project on Pine Tree Brook in Milton. On August 14, 2017 the middle dam in a series of three was significantly altered to ensure the survival of a small breeding population of brook trout that inhabits the headwaters of Pine Tree Brook. 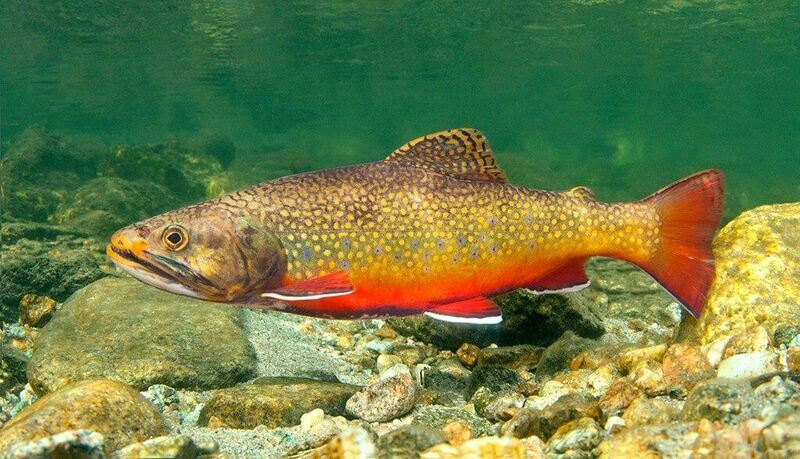 Brook trout have been in decline throughout Massachusetts, especially in the more densely populated areas of eastern Massachusetts. Trout are almost unheard of in greater Boston, which makes the Pine Tree Brook population a very rare and special population. In fact it is one of only a handful of populations that exist in the entire Neponset Watershed, the other major population is in Traphole Brook. This is why it is so important that we do what we can to ensure that they will remain for many future generations to come. Recent research out of UMass Amherst and the Mass Department of Ecological Restoration observed that mill ponds formed by dams create significant heating effects that are harmful to cold water fishes like brook trout. 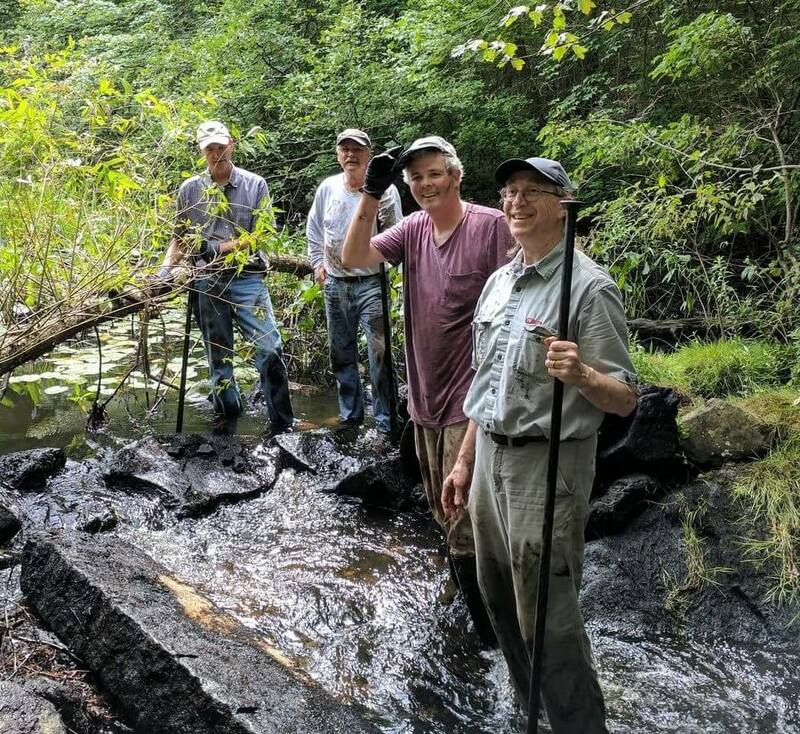 Removing the middle dam on Pine Tree Brook significantly reduced the size of the mill pond and restored a more natural stream path that will be much better for the fish. In addition to reducing water temperatures, removing the dam eliminated a major barrier to fish passage and effectively doubled the amount of available habitat for the trout to hunt and forage. When a pond is drained by dam removal, land around the edges of the pond becomes exposed. It is very important to monitor these areas closely to ensure that a healthy and diverse community of native plant species colonizes the newly exposed area rather than harmful invasive species. So in addition to dam removal, NepRWA is coordinating with DCR to manage and eliminate invasive species from the restoration area as well. Volunteers move a massive granite slab at Pine Tree Brook. The next two phases of the restoration project will involve removing a flash board at the Harland Street dam and removing a small concrete dam near Canton Ave., both of which are preventing fish from traveling beyond them. Once completed, fish will be able to travel freely from the headwaters near Hillside St. all the way to Popes Pond. Dams in the Neponset Watershed. Click for larger view. Removing dams is often much cheaper than repairing them. 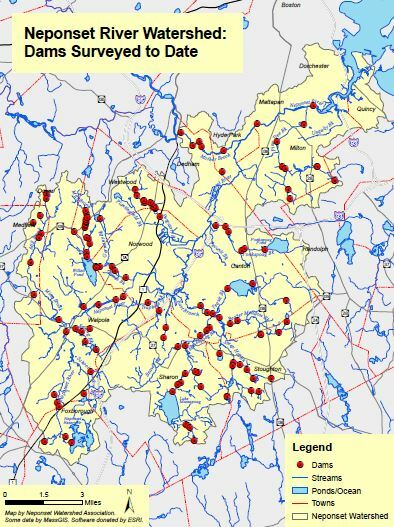 There are over 115 small dams in the Neponset River Watershed, the vast majority of which no longer serve their original purpose. As waterwheels and ice houses gave way to steam engines and modern refrigeration, almost all of the small dams along the Neponset River (really throughout all of New England) were abandoned. And while these dam and their associated ponds can have great aesthetic and cultural value, dilapidated dams also come with significant drawbacks. Read more about the Pine Tree Brook project here. Does anyone know if the Blue Hills River has trout. I’ve seen fish but couldn’t identify them. Warning-very grown over after spring, very buggy during summer. There are native trout in Ponkapoag brook too ! That is right! Have you seen them recently? I’ve been out there a bit, but have never actually seen any. Would love to have more information about that population. This is exciting work to see the results. Thank you to those In the trenches!! I recognize that granite slab in the photo. A big job well done! How can people help with the next phases? The next phases will likely have to wait until next spring/summer. In the mean time, we would love for people to send us pictures and notes of any changes they’re observing, especially pictures of fish using the site.